The Great Red Spot's clouds are much higher than those elsewhere on Jupiter. The Great Red Spot on Jupiter's face is secretly dull in color. But the swirling storm looks crimson thanks to something like a cosmic "sunburn," scientists say. New experiments show that the gases in the upper atmosphere of Jupiter turn a reddish hue when they're hit with sunlight. 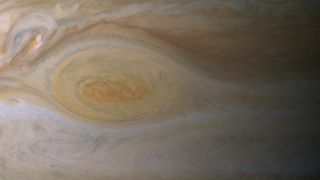 Underneath, the Great Red Spot probably looks gray or white. Scientists were treated to incredibly detailed views of Jupiter and its big spot when NASA's Cassini spacecraft flew past the giant planet in December 2000. Cassini has since moved on and is currently in orbit around its main destination, Saturn. But data from the probe's Jupiter flyby inspired Cassini scientists at NASA's Jet Propulsion Laboratory, Pasadena, California, to figure out what makes the Great Red Spot red. In the lab, the researchers created clouds of ammonia and acetylene gases to mimic the clouds in the upper reaches of Jupiter's atmosphere. They blasted these chemicals with ultraviolet light to simulate the sun's effects. This produced a reddish material, which had the same light-scattering properties as the Great Red Spot, the researchers said. "Our models suggest most of the Great Red Spot is actually pretty bland in color, beneath the upper cloud layer of reddish material," Kevin Baines, a Cassini team scientist, said in a statement from NASA. "Under the reddish 'sunburn' the clouds are probably whitish or grayish." At first, Baines and colleagues thought the red color might be produced by the breakdown of ammonium hydrosulfide, the chemical that makes up one of Jupiter's main cloud layers. But in the lab, this substance turned bright green when hit with UV light. After that mismatch, they tested which combinations of ammonia with hydrocarbons would produce the best fit for the Great Red Spot. It turned out to be ammonia and acetylene, the researchers said. Baines presented the findings this week at the American Astronomical Society's Division for Planetary Science Meeting in Tucson, Arizona.